The Tacit Project from Grathio Labs is developing a wrist mounted sonar assistive device for the visually impaired. 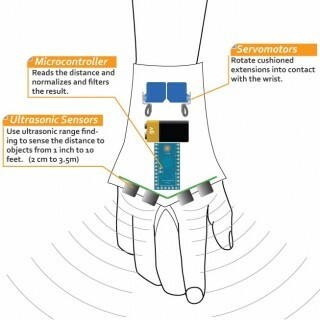 The hardware includes Parallax Ping ultrasonic sensors mounted in the glove which send distance measurements to an Arduino. The Arduino then activates small hobby servos to vibrate in the glove to communicate the relative distance to objects. You can find the schematic and source code for this developing project at the Grathio Labs website. This entry was posted on Tuesday, August 23rd, 2011 at 4:11 pm	and is filed under Arduino, sensors. You can follow any responses to this entry through the RSS 2.0 feed. You can skip to the end and leave a response. Pinging is currently not allowed.